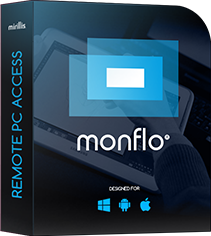 In order to provide high quality remote PC access and remote gaming your Wi-Fi or mobile network connection must provide sufficient signal and bandwidth. Low signal or bandwidth may result in lagged or corrupted quality on your mobile device in the form of misplaced squares, freezing problems etc. If you experience any of this problems please read troubleshooting instructions below. When Monflo Client app on your Android device will detect a problems with signal or bandwidth it will show the Low signal or bandwidth warning pop-up. For this pop-up you can select Do not show this message again option. Monflo Client also shows a small Low signal or bandwidth warning icon at the top of your mobile device screen informing about signal or bandwidth problems. First of all please make sure that you have sufficient network signal quality both for your Android mobile device and your PC (for PCs using wireless network). If you experience low Wi-Fi or mobile network signal please try to change your location to get closer to signal source. Please note that using Audio/Video Settings you can configure connection settings independently for WiFi and for mobile connections.